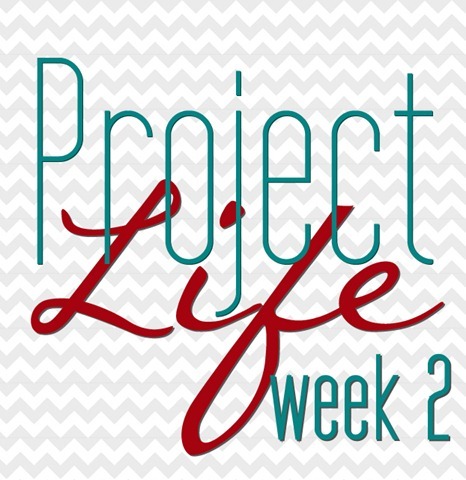 I’ve got to say, I’m loving Project Life… I know this is only the second week I’ve posted but I’m having so much fun collecting little “memory bits” to add each week. 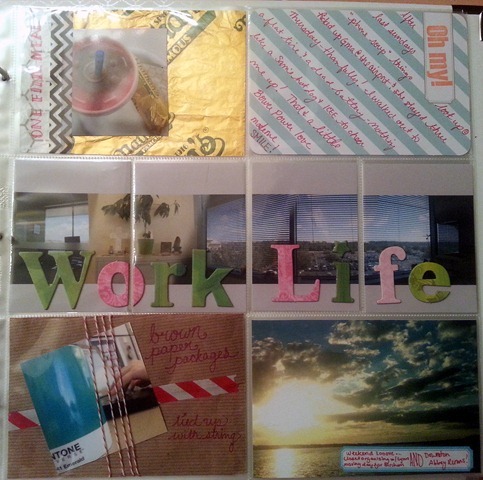 This week I received my Project Life Sea Foam Core Kit and it is more awesome than I expected. Also, I couldn’t resist the Sea Foam Paper Pack and finally committed to this binder. I did a 360 degree panorama of my cube because, let’s face it, I spend the majority of my time here. 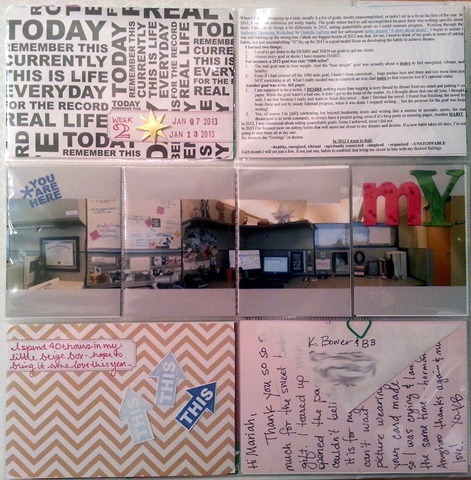 I used chip letters to write out “my work life” across the spread of 3×4 pics and stamped on a “you are here” on the first photo. I used a card from the Sea Foam Core Kit as my title card, included the text from this post about my annual goals/habits, used another sea foam card for a little explanation of my cubicle panorama and embellished with cut outs of the stamped “this” arrow. The bottom right is a card from Katie Bower from Bower Power which I was beyond stoked to receive! Did I mention I LOOOOOOOOOOVE these cards? Cause i do! I just added a star embellishment, free-handed the “week 2” and used my date stamp to mark out the start and end dates for the week. The second page hold the continuation of the panorama and a diagonal kit card that I used for journaling on the top right. This week my battery died and my tire went flat so I ended up eating dinner at Sam’s Club while waiting for the work to be done. 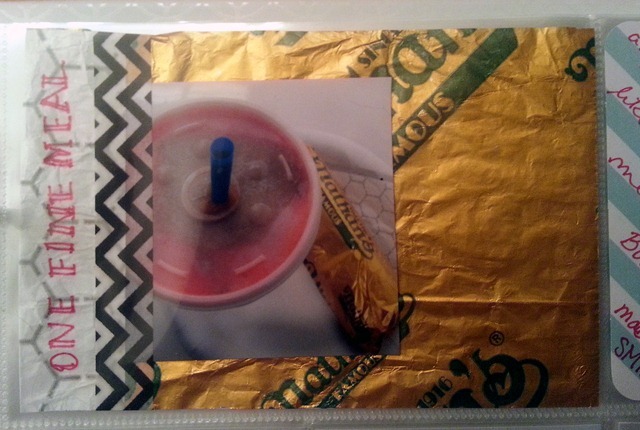 I snapped a pic of my Icee and hot dog then used a clean Nathan’s wrapper as the background, folded over the edge and secured the photo and the edge with washi tape. the hexagon pattern backing was a great place for a little writing. 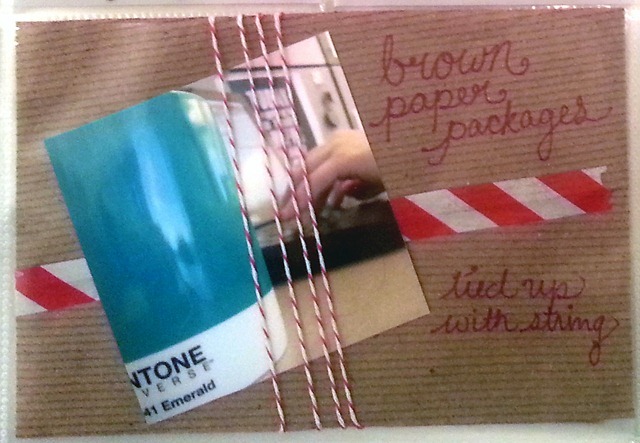 I think this was my favorite addition… I received this Pantone mug from my friend Lynn (from CaraBella Creative) for Christmas and she wrapped it in brown paper, secured with washi and baker’s twine… LOVE! I used the wrapping as the background, attached the pic with some mounting squared and wrapped the twine around it several times, securing with tape on the back. A little hand lettering and ta-da!. You’ll have to excuse the terrible photos… I’m still trying to work out the best light set up but I’ll get there! I can’t wait to have a huge binder FULL of these pages!!!! The stuff: “This” and “You are here” stamps are by Elise Blaha Cripe, “Oh My” stamp was from Michaels, label by Martha Stewart, and again, the Sea Foam Core Kit, Paper and Project Life Binder can all be found on Amazon.